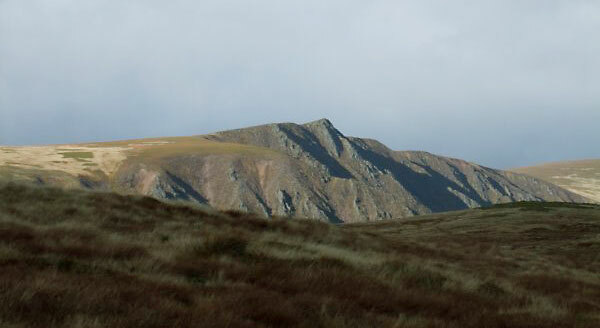 Sgor Gaoith is the highest point on the cliffs overlooking Loch Einich, therefore the whole E flank of this mountain is steep and rocky. 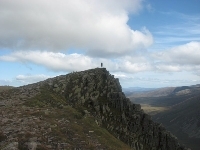 From the broad summit plateau N linking to Sgoran Dubh Mor (1111m) a ridge runs NW leading to tracks through the forests to Feshiebridge. 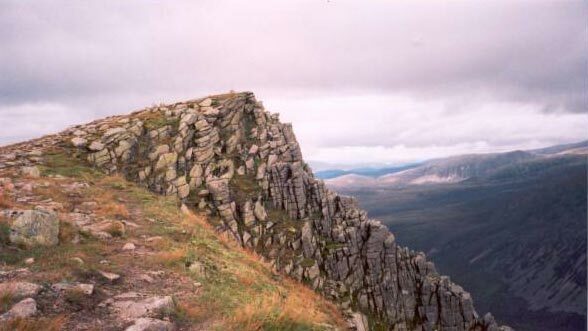 The summit cliffs of Sgor Gaoith. 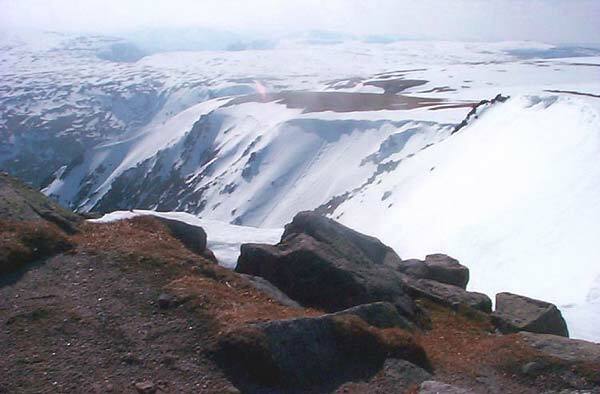 The summary information of one or more ascent routes that include Sgor Gaoith. 1 964 m 13.89 km 4.5 hrs Sgor Gaoith A relatively short route on moderately steep grass slopes. To the east of the summit steep cliffs overlook Loch Einich, navigate with care. 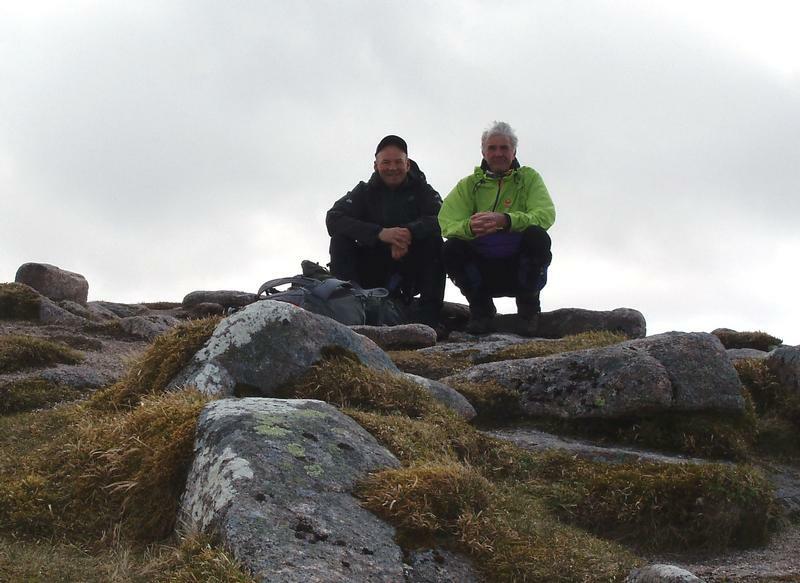 Roy and John on the summit not in rain! 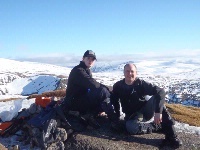 Simon and I at the summit of Sgor Goaith 05/03/2011. What a beautiful afternoon. Post a few words about Sgor Gaoith or read what others have had to say. Did it on bike from Glen Feshie. Mint trip, ascent was hard going but descent was amazing! well worth it, wouldnt have enjoyed walking these hills. So bike was a great answer to that! Alternative ascent is possible heading up the very well-maintained path beside the Allt Fhearnagan from Auchlean farm (at the road end) to just below the summit of Carn Ban Mor - this takes you up over the 1000m contour on easy paths. 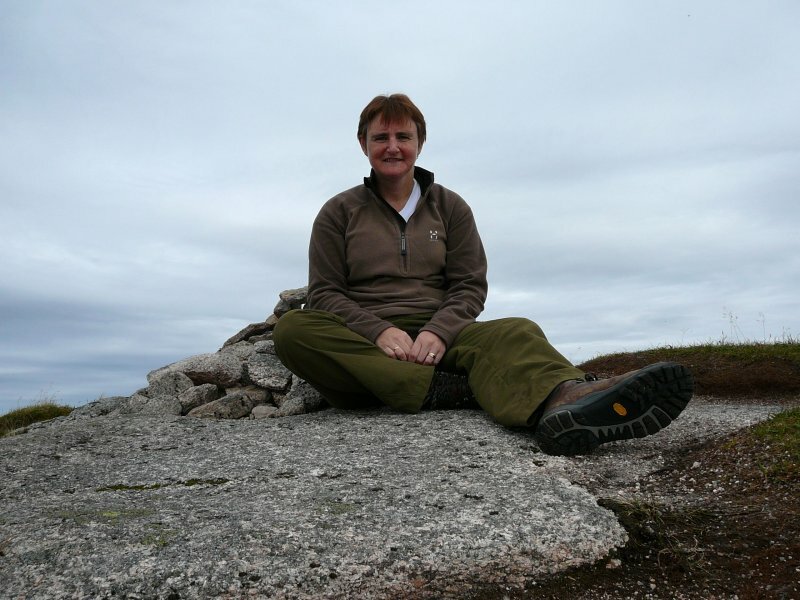 From there simply head North-East for the cliffs and follow them to the summit. this made for easy navigation in very thick, low cloud. The track up via the Allt Ruadh has recently been renovated to a very high standard and is as good as an escalator up to the 600m contour line where it dies out and a path through the heather continues onwards onto the higher slopes. 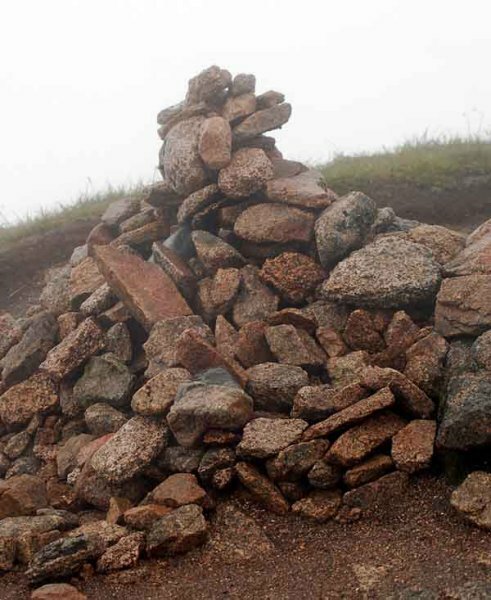 I agree with Neil, the traverse from Sgor Gaoith, over the many tops to Geal-Charn is well worth the extra effort. 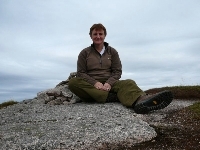 The descent (west) from Geal-Charn is pathless, initially very bouldery, then deep heather, until you reach the forest area.